Do you remember when you first brought your dog home? Do you remember that feeling of excitement as you envisioned the life you would have together, the things you’d do, the places you’d go? When was it you first fell in love with your dog? What was that moment that made your heart melt a little? Joe and I welcomed a new puppy into our lives in May of 2018; our third dog. I remember all these things as I write this blog. The moment I fell in love with Presley is about 50 minutes after I first met him. I had just cleared security in LAX and pulled him out of his little black duffle-bag carrier. He looked at me and started licking my face. Love. That was my moment. Prior to bringing Presley home, I was already day dreaming about all the things we’d do together… pupstart, core, dayschool, and club360, of course, and also he’ll be a trick star, maybe we’d do agility, he’ll travel with me everywhere and be welcomed wherever I take him, my friends will argue over who gets to look after him when we travel, he’ll be the best behaved dog at off-leash parks with perfect recall at long distances even amongst the distractions, he’ll be an actor in commercials and movies, we’ll hike together, go to swimming spots, and on and on my vision goes…. t takes time, awareness, commitment, focus and patience to reach that dream. Having a puppy is fun, but also very frustrating at times… the nipping, the lack of patience, the ‘everything is more exciting than mom’. I’m now into adolescence stage, the hardest development stage a dog owner needs to go through. And adult hood is coming, and I have a list of behaviours that I see now that I know can escalate as he matures! Do you remember seeing certain behaviours and hoping the dog will grow out of them? Do you have a dog who is good at home (when no one is looking), but ‘embarrasses’ you out in public? Do your friends and family love your dog too, or do they just tolerate your dog, or perhaps they are annoyed by your dog and prefer not being around him or her. Can you bring your dog everywhere and are they welcomed everywhere? How long is your laundry list of things that stand in the way of your dog fitting that initial image? Sometimes I feel worried, frustrated, and even a little panicked… time is running out. Or is it? Does this sound familiar? If you can relate, I’m here to tell you, you are not alone, and YES, there still is time. I don’t care how old your dog is, there is always time to make adjustments and shoot for that vision! Here’s the perfect start… you enrol your newly extended family in to puppy training classes, progress to some form of adult training, and keep engaged in regular social activities that offer new experiences with new people and new dogs, for the first two years of your dogs life. Did you just cough at the words two years? I’m not joking; I’m very serious. Why? 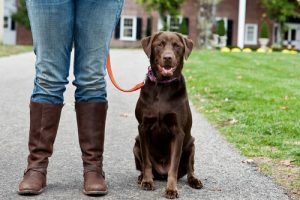 Because this will ensure you have given your dog the best opportunity to develop into a calm, well mannered member of your family, that can go anywhere with you and will be welcomed by friends and family. Your dog will be a part of your life for 15 years, invest the time in making it a terrific 15 years! You need to use positive training methods, create positive associations and memories, and commit to ongoing, regular, positive socialization. 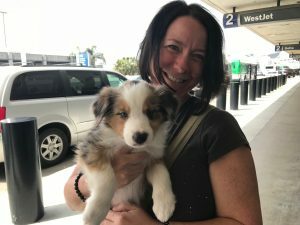 Puppies should meet 100 strangers and 100 different animals before 12 weeks of age! TIP: It’s not the number of other animals or people your dog meets; it’s the number of POSITIVE, good quality greetings your dog has. Is your dog no longer a puppy? No problem. It will take a little longer, but the path is still very similar. It all starts with awareness, commitment, dedication, and above all else, patience. Next, we need to adjust your expectations. Which, honestly, should have been adjusted in the very beginning, but is even more important with an adult dog. We have an equation: expectations – reality = frustration. The further away your expectations are from your current reality, the more frustrated you become. I have a saying: Train the dog you have, not the dog you wish you had. Adjusting expectations is not adjusting your vision. I believe it’s important to have that north star, the thing you’re striving for, but it’s equally important to understand what your dog is capable of and what type of coping skills he or she has. We also have to visit what your dog feels comfortable with and enjoys, versus what you want them to be comfortable with or enjoy. Too many times I see this disconnect between what the dog thinks is great, and what the owner wants the dog to think is great. We need to respect so much about our animals. And, we need to remember they are not robots. Each dog, regardless of breed, has its own personality, its own thought pattern, its own perceptions. Breed influences but does not determine behaviour. My first dog, Niko, was five years old when I thought there was no hope in turning his reactive, aggressive, frustrating behaviours around. Boy, was I wrong. It was a three year journey, but I saw improvements almost immediately, and bit by bit, he shaped into the dog I dreamed of (with a few minor changes to that original vision!) My alternative? Euthanize my dog. Yup, that’s what experts told me. But guess what? Niko lived to be 17, and we had an amazing time together! I learned to listen to my dog and communicate to him in the way that mattered to him! To sum it all up, you know what I did? I saved his life. This is the proudest accomplishment of my life. This is why I started clevercanines and why I created core and club360. Years of experience, and watching frustration from dog owners is why we created pupstart, jumpstart and dayschool. 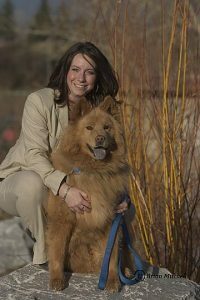 The whole idea is to provide that support for the first two years of a dogs life, and/or provide the support and encouragement to those that are getting involved when their dog is a little older. So no matter what age, it’s never too early, or too late, to start creating the relationship you desire and reach the dream you had when you first brought that little fur ball home. 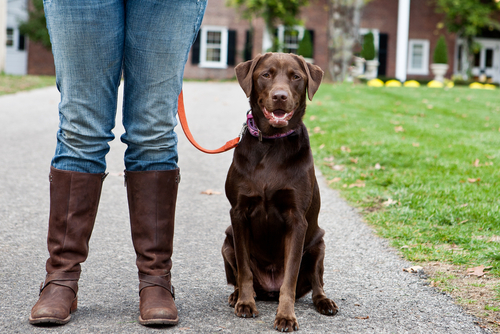 It’s easy to love a dog who is polite, well-mannered, calm, respectful, obedient, and fun. We all deserve to have a dog we love. And your dog deserves to be that dog. It’s a partnership that takes work. But I can ensure you that your dog is more than willing, which means all you need to be is a willing partner. Dreams can come true.